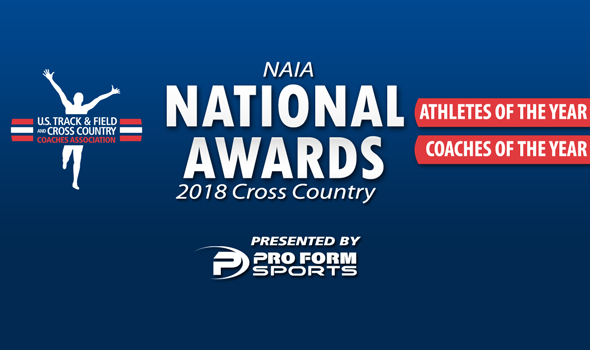 NEW ORLEANS – National Athletes and Coaches of the Year for the 2018 NAIA Cross Country season were announced Tuesday by the U.S. Track & Field and Cross Country Coaches Association (USTFCCCA), following the national championship meet this past weekend in Cedar Rapids, Iowa. Colin De Young of Cornerstone (Mich.) and Anna Shields of Point Park (Pa.) were named the Men’s and Women’s National Athletes of the Year, respectively, following their individual victories at the Seminole Valley Cross Country Course. Matt Aguero of Oklahoma City and Jack Kegg of Oregon Tech were named the Men’s and Women’s National Coaches of the Year, respectively, after leading their respective teams to national titles. Colin De Young romped to an individual title this past weekend in Cedar Rapids, Iowa. De Young covered the 8K course in 24:13.6, nearly 15 seconds ahead of Indiana Wesleyan’s Jesse Saxon, who finished runner-up. De Young was in a pack of about 10 runners at the 2 mile split, but then opened things up by the time he crossed the mat at four miles. That was the fourth win of the season for De Young. He also captured individual titles at the Bethel Invitational, at the NAIA Great Lakes Challenge XC Invitational and at the Wolverine-Hoosier Athletic Conference Championships. De Young is the first athlete from Cornerstone (Mich.) to be named Men’s National Athlete of the Year in cross country. Anna Shields is not a stranger to being named NAIA National Athlete of the Year. This is just her first time winning the award for her work on the cross country course. Shields turned in a dazzling performance this past weekend as she covered the 5K tract in 17:15.9, nearly four seconds ahead of SCAD Atlanta (Ga.)’s Emily Kearney, who finished runner-up. The senior from Torrington, Connecticut, was never challenged as she led from wire to wire. That was the sixth win of the season for Shields. She also won individual titles at the Trailblazer Invitational, at the Tommy Evans Invitational, at the LHU Invitational, at the NAIA Great Lakes Challenge XC Invitational and at the River States Conference Championships. Shields is the first athlete from Point Park (Pa.) to be named Women’s National Athlete of the Year in cross country. Oklahoma City used a complete team effort to top the podium at the 2018 NAIA Cross Country Championships. The Stars, under Matt Aguero’s watch, put four runners in the top-3o scoring positions as they totaled 116 points to beat runner-up Indiana Wesleyan by 27 points. Max McNeill and Oscar Kipkoros were the top finishers for Oklahoma City in ninth and 10th place, respectively. Earlier in the year, the Stars dominated the NAIA Mid-States Classic as they won by 55 points. This is the first time that Aguero has been named Men’s National Coach of the Year during the cross country season. Oregon Tech fought tooth and nail for the women’s team title this past weekend at the 2018 NAIA Cross Country Championships. The Owls, who entered the meet ranked No. 1 in the Women’s National Coaches’ Poll, held off a strong effort from Madonna (Mich.) and Taylor (Mich.). Oregon Tech, led by Jack Kegg, scored 125 points thanks to two runners who finished in the top-5, and held off the hard-charging Crusaders by seven points. Earlier in the postseason, the Owls cruised to the team title at the Cascade Conference Championships with a miniscule total of 29 points. This is the first time that Kegg has been named Women’s National Coach of the Year during the cross country season.